Ending unauthorized immigration is at the heart of current federal initiatives in both immigration and social policy. The intertwining of these two areas of policy is nowhere clearer than in the 1996 passage of both the Personal Responsibility and Work Opportunity Reconciliation Act (PRWORA), better known as Welfare Reform, and the Illegal Immigration Reform and Immigrant Responsibility Act (IIRIRA). Immigration status became a key point of differentiation in access to public benefits as cutbacks were instituted with the stated goal of curtailing undocumented immigration. The denial of public benefits to limit unauthorized immigration has a disproportionate impact on those groups with large cohorts of recent immigrants. In Massachusetts, Latinos and Asians are particularly affected. Because of the link between immigration status and social policy, even members of the same family may be faced with different sets of eligibility rules for public services. This “patchwork” of entitlements brings confusion to both users and providers and ultimately impedes access to services. This paper focuses on the impact of immigration status on eligibility and use of human services by immigrants to Massachusetts. 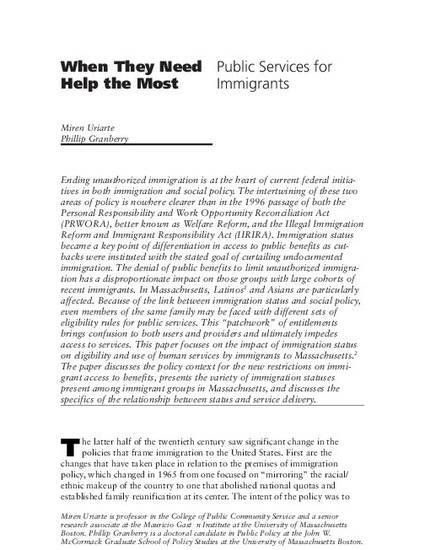 The paper discusses the policy context for the new restrictions on immigrant access to benefits, presents the variety of immigration statuses present among immigrant groups in Massachusetts, and discusses the specifics of the relationship between status and service delivery.